Four exceptional Emory College seniors will study in Scotland next year on topics ranging from healthcare to sustainable development to art history as part of the Robert T. Jones Scholarships. 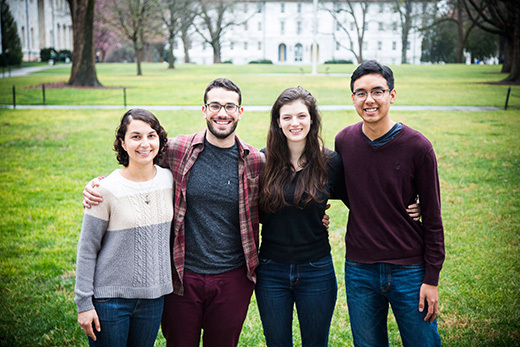 Known as the Bobby Jones scholars, Laila Atalla, Hannah Rose Blakeley, Adam Goldstein and Lucky Khambouneheuang join more than 200 previous Emory students who have traveled for a year of study at the University of St. Andrews. Emory has hosted an equal number of St. Andrews students as part of the scholarship exchange started 40 years ago in honor of the legendary amateur golfer and scholar who attended Emory's School of Law. The prestigious program honors the best representatives from each university, with an emphasis on academic excellence and exemplary character and integrity. Although the students may take courses without seeking a degree, all four 2016 Bobby Jones scholars say they are eager to pursue degrees that complement their Emory studies. Atalla, a double major in environmental sciences and Latin American and Caribbean studies, and Goldstein, who is majoring in American history and strategy and management consulting, both plan to seek master’s degrees in sustainable development. Atalla’s goal is to work in climate change adaption, developing policy changes for transportation systems or the food supply to help protect people against the effects of climate change such as drought or sea level rise. She previously studied a year in Chile through Emory and found experiencing different cultures allowed for different ways of examining problems. “I’m hoping that taking myself out of my comfort zone again will help with a more global perspective I can apply anywhere,” says Atalla, who is an Ignatius Few Scholar. Goldstein, who wrote his honor’s thesis on the Villages of East Lake mixed-income development in Atlanta, plans to focus on affordable housing in Scotland. The country has been an experimental site in the U.K. for both homeless housing and assisted market housing, he says. Khambouneheuang, a biology major with a minor in science, culture and society, hopes for a similar comparison between the U.S. and Scotland in the health care arena. He will seek a master’s in health psychology to complement his scientific background, hoping for a more comprehensive approach to medical care for his future plan of becoming a physician. End-user experiences are important to Blakeley as well, but with a focus on rarely seen works on paper, such as etchings and drawings. Blakeley, whose double major in interdisciplinary studies and French has allowed her to focus on art history, plans to zero in on such works from 19th and 20th century European artists in her time at St. Andrews. The university already has begun migrating one collection of some works into an online database. Blakeley, who is a Dean’s Achievement Scholar, plans to pursue a master’s degree in art history that will include a scholarly review of museum works but also allows her to increase viewing of works on paper that rarely get gallery time in part because of their susceptibility to light damage. Two alternates for the 2016-2017 Bobby Jones Scholars were also announced this week. They are Bryan Natividad and Alexandra Rongione.